In July 2000 J B Furnace Engineering Ltd acquired manufacturing, replacement spares and support rights for Leeds and Northrup (L&N) Heat Treatment Furnaces and added them to their current range of products along with a range of Quick Tip Connectors and thermocouple wires. All replacement parts and New Furnace Equipment for the entire range of L & N Furnaces manufactured and supplied to original engineering standards and specifications. Established clients within the Aerospace, Automobile, Tool / Bearing Manufacturers, Heat Treatment and General Engineering engaged in the Ferrous and non-ferrous Metal Industries. After Sales Service. Technical and Engineering support for both UK and Overseas projects. Dedicated Work Force for On-Site Furnace Repair Contracts. 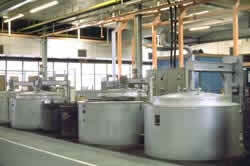 Re-bricking and Renovation of Pit / Horizontal types of Heat Treatment Equipment and Metal Melting Furnaces considered. Our mission is to provide Superior Customer satisfaction by ensuring Quick responsiveness, top Quality and innovative products, maximum Value to our customers.